Hank Wilson, one of the most compassionate and effective activists in San Francisco, died November 9th of lung cancer. He was 61. “You’re really humbled by someone like Hank,” said Supervisor Tom Ammiano, who co-founded the Gay Teacher’s Caucus with him in 1975. “He was Mother Teresa on testosterone.” A Sacramento native, Wilson founded and worked for many non-profits during four decades in San Francisco. He served on the Gay Youth Advocacy Council (which became LYRIC), and founded the Butterfly Brigade – a safety group in the Castro. Wilson had a profound impact in the Tenderloin, where he managed the Ambassador Hotel for 20 years – a supportive housing model for people with AIDS. 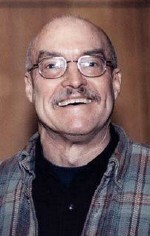 He co-founded the Tenderloin AIDS Network (later TARC), and managed a drop-in center for the homeless. I first met Hank in 1999 when he led the “Draft Tom Ammiano” for Mayor campaign – whose effects are still felt today. Activists have set up a makeshift shrine for Hank at 18th & Castro (in front of the Bank of America building), and well-wishers are encouraged to leave flowers and letters. His friends are planning a public Memorial Service about a month from now.